AHN myLab® Hematocrit Centrifuge is used for determination of volume fractions of erythrocytes (red blood cells) in blood and also for separation of micro blood and solutions. It provides hematocrit values (HCT) for testing in biochemistry, immunity, genetics, blood separation and for general clinical tests. Contact us to test AHN myLab® Hematocrit Centrifuge free of charge worldwide. AHN myLab® Hematocrit Centrifuge is extremely compact, taking the very minimum of your benchtop space. Moveover, you can carry it with you, whereever you need to use it! AHN myLab® Hematocrit Centrifuge accelerates the samples up to 12000 rpm, corresponding to 14119 x g. The speed can be increased with an interval of 100 rpm starting from 500 rpm. The speed displayed in RPM and RCF toggles alternatively on the display during operation enabling close monitoring. The rotor of AHN myLab® Hematocrit Centrifuge accommodates 24 capillary tubes of 75 / 45 mm length. Equipped with a brushless DC motor, AHN myLab® Hematocrit Centrifuge is maintenance-free and ideal for extended run sessions. The digital back-lit LCD display shows multiple parameters. AHN myLab® Hematocrit Centrifuge automatically saves the last run parameters. You can run your required parameters with a single press thanks to the Preset function, avoiding setting up the speed and time by each centrifugation. 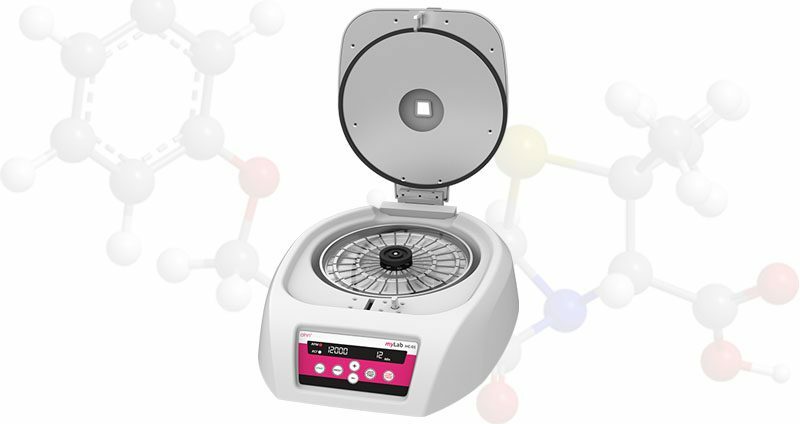 AHN myLab® Hematocrit Centrifuge 12000 rpm detects unevenly loaded samples automatically. The imbalance detection function notifies you about it before the centrifugation starts. AHN myLab® Hematocrit Centrifuge 12000 rpm has an automatic system preventing the lid from opening upon centrifugation. Furthermore, the screw on the rotor lid prevents from accidental spillages and cross contamination.